Really cool old style hot rod. 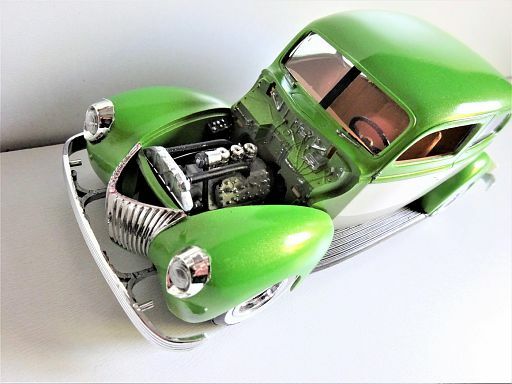 Great looking build! I love the colors and wheel combination. Everything looks just right. Thanks TarheelRick. I was origally going to do the bottom white section as a woody! Thanks maniacalmodeler. My initial idea was to woody the white section each side, but when I took the masking tape off I left it as a two tone. The wheels are AMT Meyers Manx but I don't remember where the white insert whitewalls/tyres came from. Thanks chromecop. I took the bumpers from the Mercury kit as I didn't like them on that, plus I've never seen a 37 Desoto, so can't comment on that. 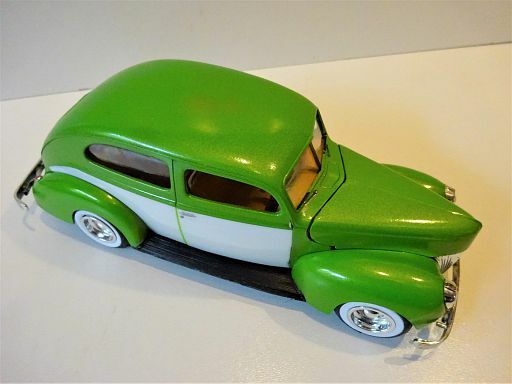 I've never seen a '39 Ford with a two-tone paint scheme. Looks great! 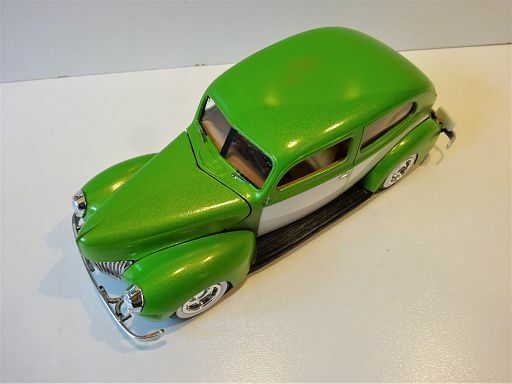 The bumpers are identified as being Desoto bumpers in the details section of the description of the kit. It doesn't state what year, but since the '37s are the ones most popular.... But there is a company that produces a reproduction with that rib and flute style that comes in a extra long piece that you're supposed to cut to whatever length you want and bend and shape it as desired. Nice color combo. The effect of The tutone paint and wide whites is perfect. Thanks guys. 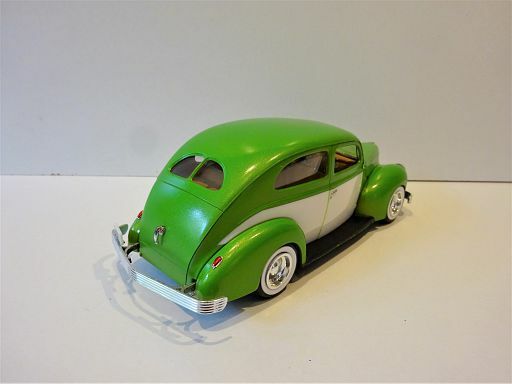 As I said before the bumpers came from an AMT 1939 Mercury kit. As we don't have American cars here I have no knowledge of them I just take the info from each kit I build.